Bobbi Kristina Brown's family gathered Saturday at an Atlanta-area hospice-care center where the 22-year-old daughter of the late Whitney Houston was moved last week amid concerns about her deteriorating health, according to People magazine. She was transferred to the facility Wednesday after her condition began to worsen. The move came at the same time her estate filed a lawsuit against her ex-boyfriend Nick Gordon on theft and abuse charges. 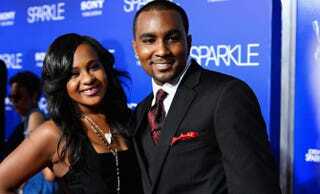 She is the only daughter of Houston and R&B singer Bobby Brown. Hospice visitors on Saturday included her aunt Pat Houston—who is married to Whitney's brother Gary and serves as her legal joint guardian with Bobby—and Bobby's sister Tina Brown, the report notes. The women were seen hugging each other outside the care facility and crying, People writes. "A miracle could still happen," a Brown relative told the magazine soon after Bobbi Kristina was moved into hospice care. The district attorney's office said Thursday that prosecutors are investigating the Jan. 31 incident during which Bobbi Kristina was found comatose and facedown in a bathtub at her Atlanta home. Although the suit lays the blame for her condition at Gordon's feet, an unnamed relative of Gordon's told People that he or she believes Gordon is being used as a scapegoat in the incident. Read more at People magazine here and here.